FIU and the Universita per Stranieri di Perugia in Italy are formalizing collaborative efforts to address global water and environmental challenges. The two universities signed a memorandum of understanding to explore the possibility of developing academic, scientific and cultural programs. This includes offering undergraduate and graduate courses, encouraging pursuit of doctoral degrees, establishing student and faculty exchanges, launching professional development programs and identifying funding opportunities. Both universities have long-standing traditions in water and environmental research, outreach and policy. Associate Director of the Southeast Environmental Research Center Piero Gardinali, FIU Provost and Executive Vice President Kenneth G. Furton, Honorable Consul General of Italy in Miami Gloria N. Bellelli, and Director of the Water Resource Research and Document Center Fernando Nardi signed a memorandum of understanding to tackle water and environmental problems. The Universita per Stranieri di Perugia is home to the Water Resource Research and Documentation Center dedicated to advancing research, training and scientific communication in the fields of water, environment and disaster risk management. The university also hosts the UNESCO Chairs Programme in Water Resources Management and Culture, which allows higher education and research institutions to pool their resources, address pressing challenges and contribute to community development. FIU is home to the Institute of Water and Environment, dedicated to addressing global water issues and broader challenges impacting the environment. The institute brings together some of FIU’s top interdisciplinary centers and programs, including the Center for Aquatic Chemistry and Environment, Marine Education and Research Initiative, Southeast Environmental Research Center, Sea Level Solutions Center and international water programs. 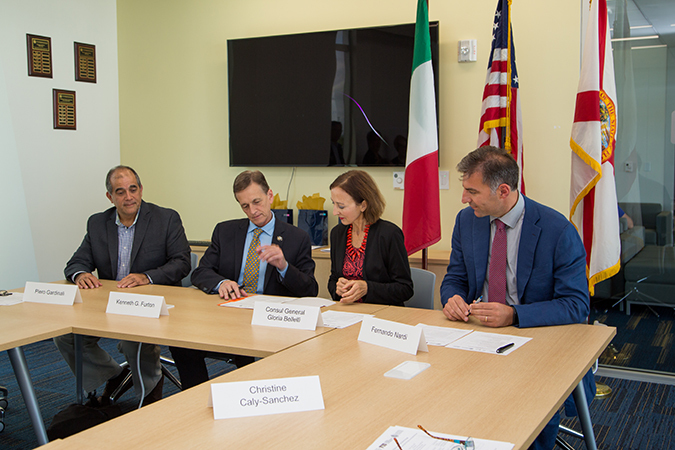 In addition to the signing of the memorandum of understanding, representatives from the Universita per Stranieri di Perugia, as well as the University of Florence and the Italian Consulate General of Miami, participated in a series of workshops and lectures on international water infrastructures and security hosted by FIU. The exchange is endorsed by Gloria M. Bellelli, Honorable Consul General of Italy in Miami. The consul will be involved in the joint initiative to address topics of relevant common interest and strengthen the collaboration. According to Bellelli, sea level rise is of particular concern for Italian coastal communities whose exposed assets make them particularly vulnerable.